During Ambien detox, you can expect the recurrence of insomnia, as well as abdominal and muscle cramps, vomiting and tremors, or nervousness and panic attacks. More on how to treat these symptoms here. People who are physically or psychologically dependent on Ambien (zolpidem) find it very hard to stop using it or cut down because of withdrawal symptoms. In fact, suddenly stopping your use of Ambien can be dangerous. So, how can you detox from Ambien safely? Find out more here, with a section at the end for your questions. Ambien detox: What to expect? 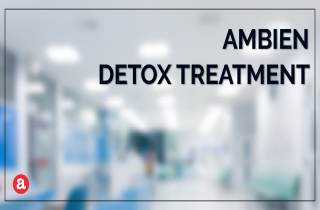 While no standard detoxification regimen has been proposed to date – despite the similarity of effects of Ambien and benzodiazepines at high doses – there are some general guidelines that you can follow. So what occurs during Ambien withdrawal syndrome and detox? An Ambien addict should undergo medically supervised detoxification, as the dosage of the drug should be gradually tapered until it is eliminated completely from the person’s system. However, gradual drug detox may not work for some Ambien addicts, and in these cases, drug replacement therapy may be performed. In a drug replacement approach, a similar drug with a longer half-life is substituted for the addictive drug. In extreme cases, such as when a person can’t or won’t taper, there is always the option of hospitalization and rapid detoxification with a continuous flumazenil infusion. Flumazenil works as a benzodiazepine agonist (among people with benzodiazepine tolerance). When administered continuously, it allows for the abrupt discontinuation of Ambien and a rapid detoxification. Flumazenil is often used in an inpatient setting to mitigate a drug replacement approach when substituting a long-acting benzodiazepine for Ambien. The procedure should be performed by board-certified physicians and a team of specialized nurses to ensure safe withdrawal from Ambien. 1. Begin with a slow taper of the hypnotic agent (zolpidem) that you are already taking. This taper may be conducted over several weeks or perhaps even months. When making a tapering plan consider taking your time and know that spaced gradual reductions cause fewer withdrawal symptoms and less rebound insomnia. You might consider a 10% reduction every 2 weeks. Or, you can try a slightly more aggressive tapering plan, such as reducing by 10% per week, knowing that you can always slow things down if it becomes unmanageable. 2. Switching to a benzodiazepine if you have a serious abuse problem with your primary agent may be therapeutic. Benzodiazepines with a long half-life can be effective; chlorodiazepoxide and clonazepam are recommended. Or, switching to a long-acting barbiturate like Phenobarbital can be effective. 3. Anticonvulsants such as carbamazepine and valproate, as well as sedating antidepressants such as trazodone and imipramine, have been advocated for use in withdrawal from Ambien. 4. A variety of cognitive and behavioral techniques have been proposed to assist a medication taper. We hope we’ve helped address the main ways that Ambien detox is treated. Remember that Ambien detoxification may require intervention during a period of crisis; encouraging users to make changes in the direction of health and recovery can help. but this process should begin when the patient is medically stabilized. Still have questions about Ambien detox treatment? Please leave your questions in the comments section below. We do our best to respond to you personally and promptly. cutting the pills in quarters and even in eights if it’s possible to cut them that small….Nothing I’ve read gives any recommended tapering schedule….Do you have one that you are comfortable with? Please e-mail me with some meaningful answers….Thanks…. Bob. I have ADHD, and I’ve never slept too well. I take Ambien 10mg nightly. I would love to get off, because I am a chronic pain patient as is, & I take lots of medicines. During withdrawals, I get high anxiety & depression. What is my best course of action on getting off? Hello Judy. Thank you for your comment. I’d say your cut in doses was a bit drastic, you may want to try a more gradual taper. I’d advise you to see a doctor, have him/her help you create a tapering schedule according to your needs. You may also need some other medications, such as OTCs to manage the withdrawal symptoms as they occur. I wish you the best of luck in quitting! And please write again if you have any other questions. I am a 60 yr old female who has been taking 10 mg of Zolpidem for the past 14 years. I would really like to stop taking them. My efforts of cutting them in half haven’t been successful, I wake up and find myself anxious about not sleeping, so I go back to the full dosage. Can someone advise me of the best way to get off of these completely? Hi Kirk. You can lower doses as you feel most comfortable. Whether you do a slower or a faster taper it depends on your preference. Also, it takes some time for your brain chemicals to return to normal after you stop taking Ambien and begin to sleep normal without any assistance form medicines. I have been using generic Valium for years to sleep. Usually cutting the tablets in quarters so as not to become dependent. I then started taking Ambien in the same fashion on and off. I now have been relying on Ambien for the past year as my main source of insomnia relief. I am prescribed 10mg tablets, but cut them in quarters. I decided to stop taking Ambien cold turkey and had difficulty sleeping the first night. I fell asleep, but would awake two hours later. It then took me thirty minutes to an hour to fall asleep again only to find myself awaking again about every two hours. This happened consistently over the four days of my efforts. I’m back to nightly use again. Last night I thought I would try again only to find myself awake an hour later. Realizing I need to sleep, I took another quarter. I want so badly to stop relying on medication to sleep, but am left with frustration and reliance. I had just relocated to South Korea with no work and obviously no medical care. I was hoping to start a new life without the dependency. I don’t feel like I’m addicted to the drug, just reliant. And yes, I know what that sounded like. I’m 62 years old and need to stop this reliance for sleep. I know I should lower my dosage, but I’m already cutting the 10mg into quarters. Should I try eights? How should I go about weaning off this medication? Any suggestions would be helpful.